Scanning & Archiving - Print-O-Stat, Inc.
Where would your company be if there was an earthquake, fire, flood or other tragic disaster that destroys the immense knowledge and value contained in your hard copy documents? Print-O-Stat offers a cost-effective means for capturing and converting a wide range of documents, allowing your organization to gain control of its most valuable information. Through a state-of-the-art document management solution, we provide high volume, high quality scanning, indexing and conversion services to help you free up valuable office space and protect your hard copy documents by converting your documents into an easy to search electronic storage system. Delivered by the box, or by the skid, we will handle large quantities of documents. 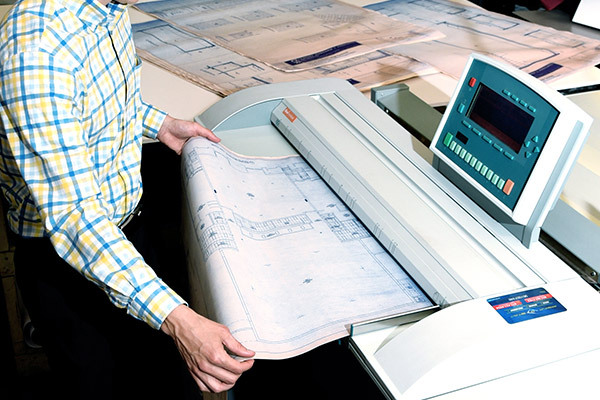 Blueprints, survey plans, topographical maps, mechanical drawings, architectural plans and engineering drawings. Photographic film with protective lightproof backing paper wound onto a spool. A punched card with a cut-out window into which a chip of microfilm is mounted. A flat piece of film containing microphotographs of the pages of a newspaper, catalog, or other document. Specsheets, letters, reports, statements, tax records and invoices. Converting jpg, bmp, and other raster formats into vectors. Why consider Print-O-Stat as my source for digital archiving and retrieval?